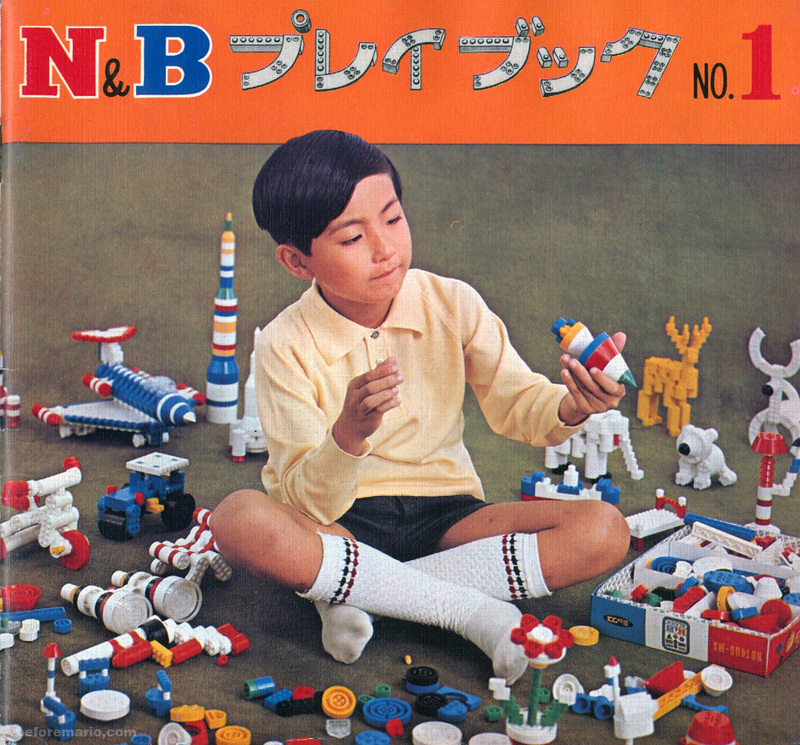 In the late 60s in Japan, Nintendo created a range of construction sets with colorful plastic blocks. 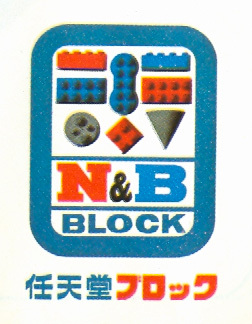 It was called Nintendo Block (任天堂 ブロック), which was shortened to "N&B Block" or just "N&B". The Nintendo N&B Block series was copyrighted to Nintendo, without any license from LEGO, however it was clearly "inspired" by the bricks from the Danish toy manufacturer. 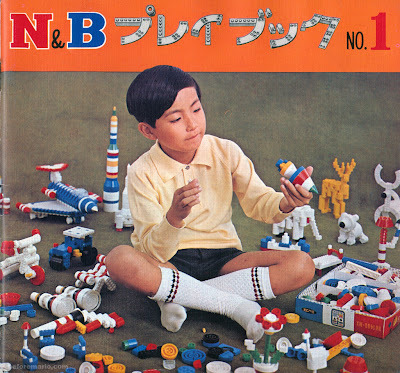 Legal hairsplitting aside, the Nintendo N&B Block series stayed close to their source of inspiration - in particular in the concept of the interlocking blocks - but also included enough original ideas to go beyond a simple copycat scheme. 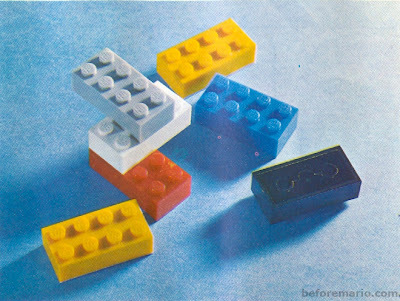 A first version of the LEGO brick was designed as early as 1947. An improved version, still in use today, was conceived in 1958. 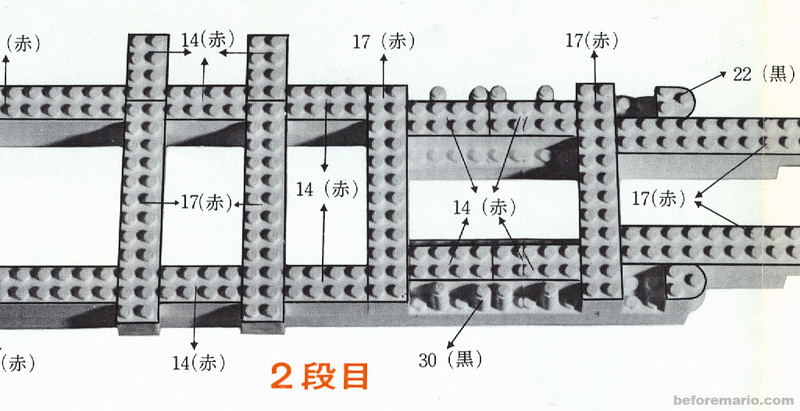 The great innovation of this final LEGO brick design was the use of interlocking tubes on the inside of the brick, allowing for much more construction options. Around 1962, LEGO sets started being sold in Japan. In 1968, with sales hits like the Ultra Hand and Ultra Machine under their belt, Nintendo went after this interesting segment and introduced the N&B Block series. 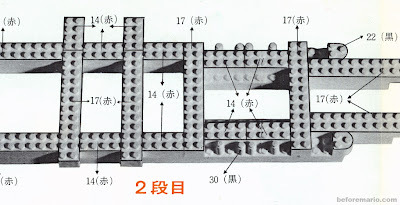 The rectangular N&B Block bricks are very similar to LEGO blocks. The dimensions are identical, allowing the two systems to be mixed. The N&B blocks even feature the N&B name on the top of the studs, similar to their LEGO counterparts. For presumably strictly legal reasons, the design of the tubes on the inside differs from the LEGO version, which prevents the N&B blocks from being a straight copy. The tricky part of manufacturing construction blocks is that they have to fit well together and hold, but also allow dis-assembly without too much effort. 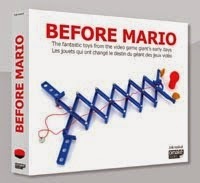 It has to be said that in this respect the Nintendo production process was slightly inferior to that of LEGO in terms of managing size tolerances, which meant that the N&B Blocks were sometimes harder to separate after they had been put together. The unique eight-shaped N&B Block - called block "No. 55"
The innovation by Nintendo was to add a range of round shaped blocks: cylindrical and conical shapes, as well as a special "8" shaped piece. Of course, the round and rectangular N&B blocks interlock and can be mixed. In later years, LEGO also introduced more round shapes. But in the 60s their models always were very "blocky", and in this respect the N&B Block series was actually more versatile. 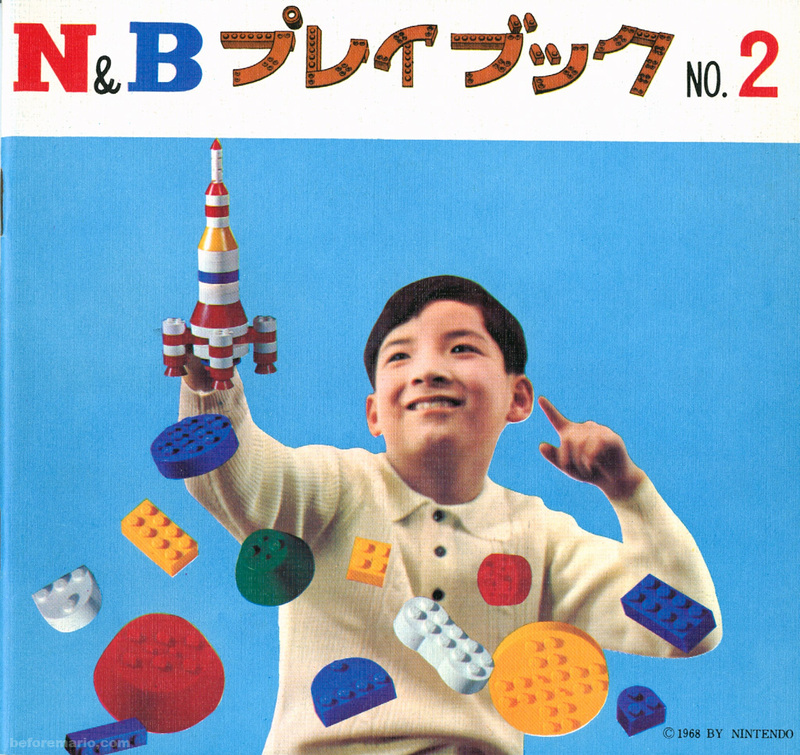 Nintendo even went as far as to point out the difference between N&B Blocks and LEGO in comparative commercials. The LEGO brand was not named, but the message was clear. Which parent would want his or her dear child to be this unhappy? The choice should be obvious: buy N&B Block! This strategy worked, and the series became very popular. 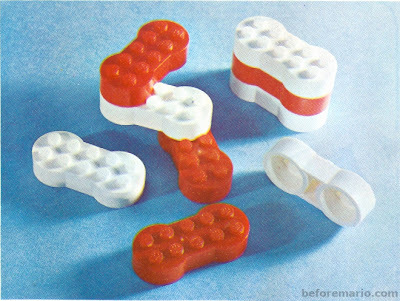 So, the N&B blocks themselves were not completely original. But all the sets in the N&B Block series were new designs by Nintendo. It was a comprehensive, well thought-through range of products; with starter sets (including the so-called Mixed sets), model sets as well as sets with supplementary parts. Most were introduced in the late 60s, but new sets (like the N&B Block Ringer) were added until the early 70s. The Mixed sets, as well as some of the other sets, came with an instruction booklet (プレイブック or Play Book) that included building plans for a large number of models. This Play Book could also be bought loose, for ¥50. Soon after the launch of the N&B Block series, a second Play Book was released, providing further building inspiration. 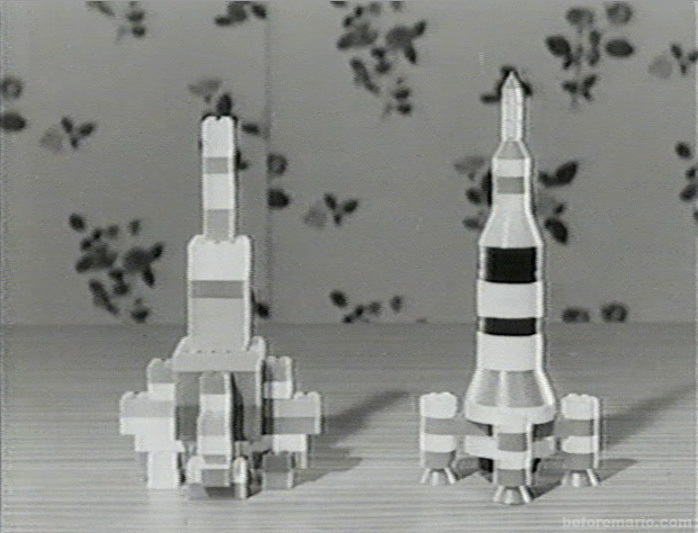 The Mixed sets were sold in a number of sizes and variants. Prices for the these Mixed set ranged between ¥800 and ¥1,800. The Mixed sets provided a good "mix" of different types of blocks, both round and rectangular shapes, allowing the young builders' imagination to go in every desired direction. 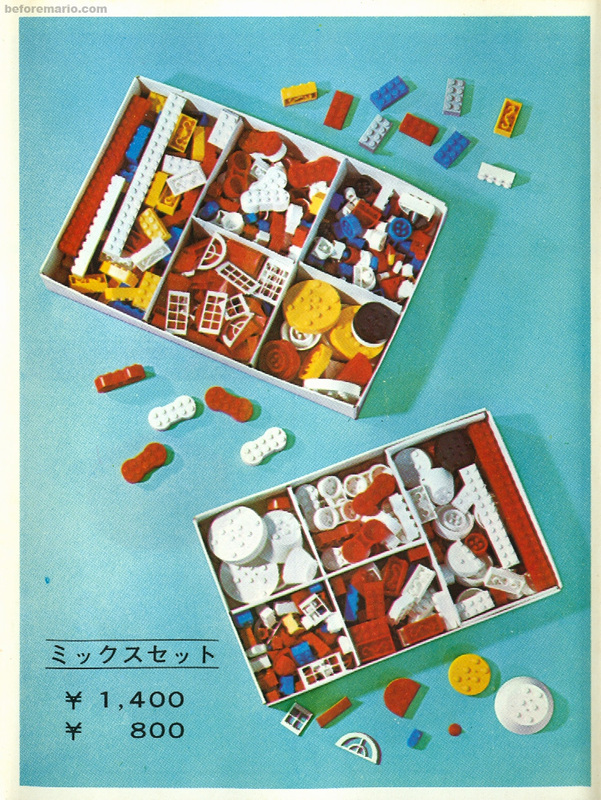 Besides the Mixed sets, additional starter sets were available which only contained rectangular blocks. Because of the absence of any round shapes, these were the N&B Block sets that most resembled boxes of LEGO. Next to the these generic building sets, the N&B Block range consisted of lots of sets dedicated to building a predefined model. Although these sets left less to the imagination, they allowed building more complex and well designed models. The model sets included themes like houses, planes, boats and - very popular in this era - rocket ships. The N&B Block sets came in cardboard boxes, with N&B logos printed on the exterior of the bottom-half. The boxes were tapped shut with special N&B tape. Later sets included more durable polystyrene foam trays to store the bricks. The side art of the boxes also changed to included a more visible N&B logo. 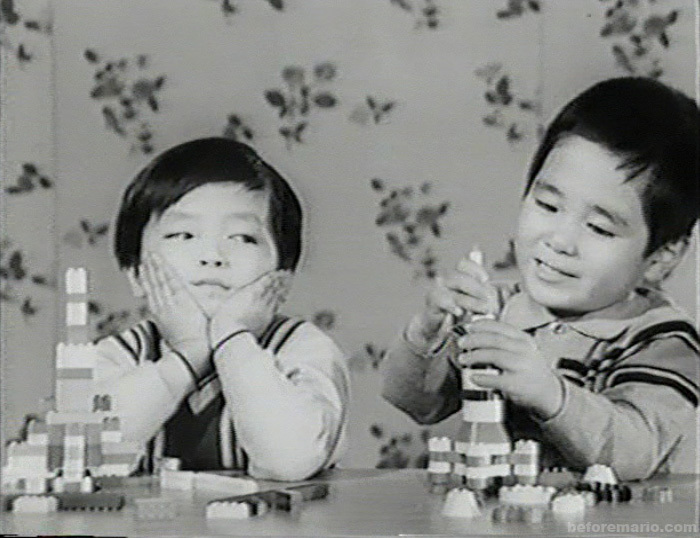 The initial releases of the model sets included black-and-white building plans. These building plans included annotations to identify the required block color. 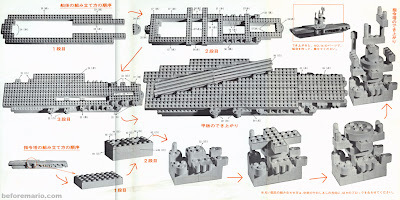 The black-and-white instructions were not very practical, and later releases included full color building plans, which also showed more intermediate steps. The Rocket set (NB 980-R) went through a small redesign between first and second release. While the second release is quite common, the first release is very rare and hard to find these days. 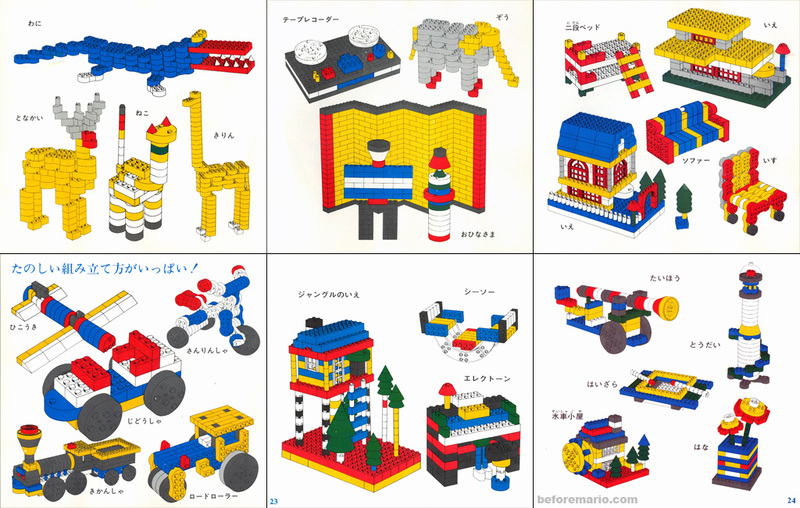 Most of the N&B Block sets were created around typical boys' interest, but some sets for girls were also designed. With the Playing House Set (ママゴトセット) you could build miniature furniture for a dolls house. 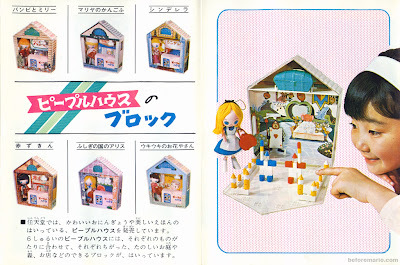 Another Nintendo toy series aimed at girls is People House. Although strictly speaking not part of the N&B Block series, each of the People House sets included a small box with N&B blocks. 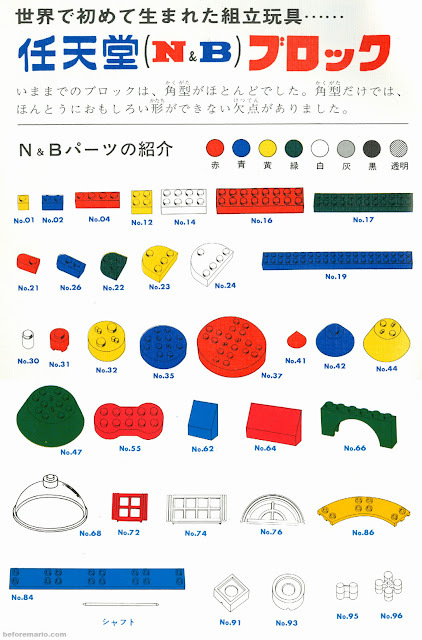 In case you wanted to extend your collection of N&B blocks with bricks of a particular shape and color, you could turn to the supplement sets. A wide range of these small Parts sets were available, for ¥100 or ¥200 each. 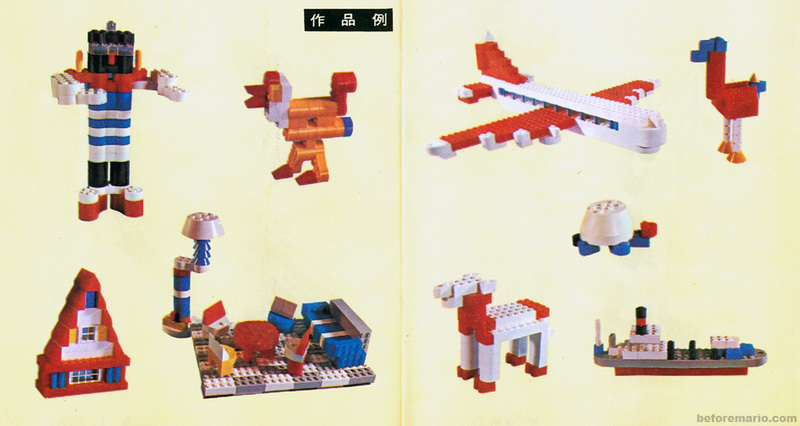 The back of the Parts sets contained pictures of simple building ideas. N&B blocks were a quality product with a long life value, and the blocks maintain their shape and color to this day. The N&B Block series contains some very nice sets, with the heroes sets and Crater as my personal favorites. It was also commercially very successful. 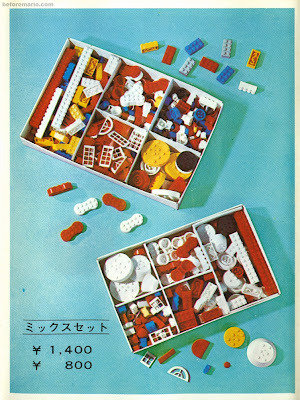 Because of the large number of sets manufactured, they are not very hard to find in Japan these days, although some of the models are much rarer than others. 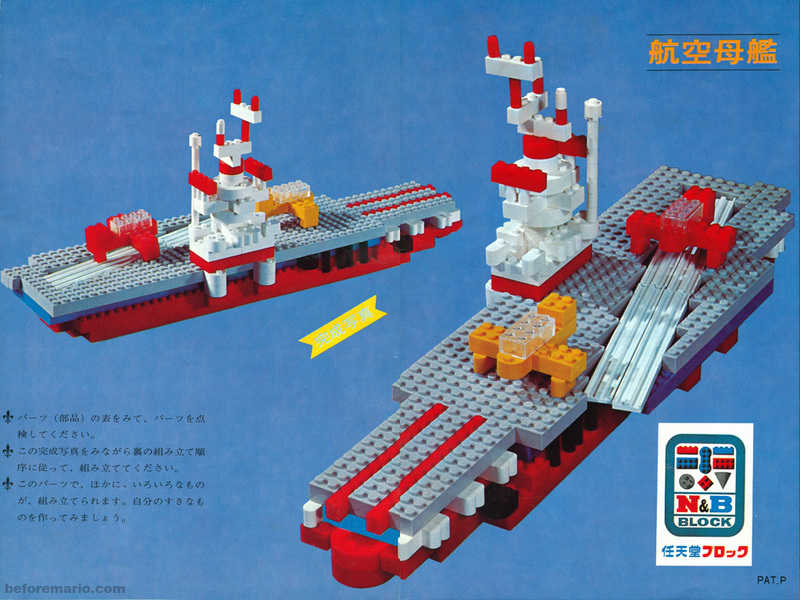 Nintendo stopped the N&B Block series in the early 70s, most likely due to legal pressure from LEGO. 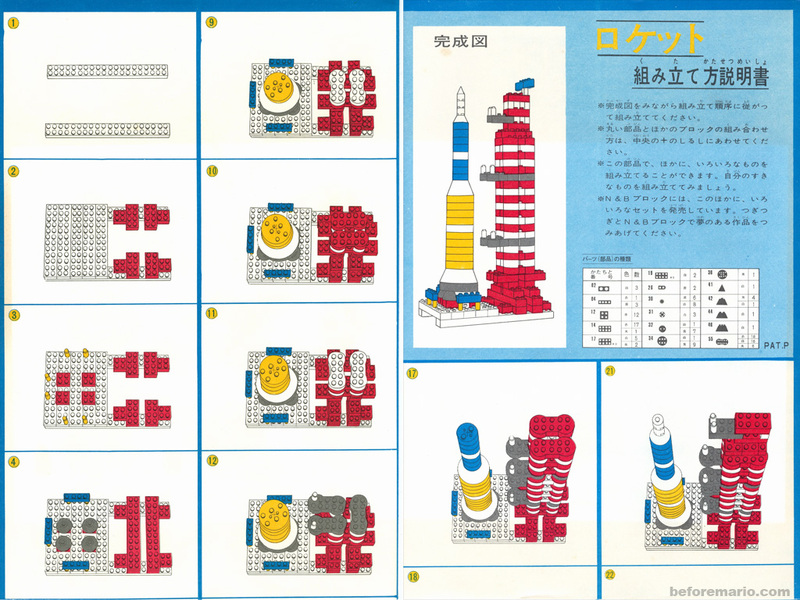 The final block construction set to appear was the panda set from 1972. An overview of all Nintendo N&B Block sets can be found here, details of the Parts sets here, a gallery of box art is presented here and a promotional campaign here. Yes, that's cool. 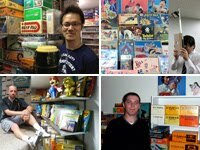 Nintendo does regularly honour its past! Interesting to notice the Nintendo would publish a LEGO video game many years later, namely LEGO City Undercover.